Join the discussion on our forums! Come discuss Landscaping over in our dedicated Landscaping discussion topic. The Bob Ross flavor text is real. I'm not sure there's enough treant synergy to justify playing this card. You would have to play like a treant token deck or something with force of nature and soul of the forest. the cards really not bad on it's own. But "not bad" doesn't cut it for constructed. If there's more treant pay off cards that are good this card can def see play. Looks solid. Good combo with new archetype plans. The apple generating Treants will be good to combo with it too. At first it seems good, but then, look at Pantry Spider. I think that this card is just at the same power level. This card is weak to Rogue upgraded HP, and 2 Silver Hands Recruits can destroy a Treant (or any 1-attack minion with Archeous Veteran/Raid Leader/ Maul). But it's still a 3 mana 4/4 so I voted for playable, also because druids can easily buff their minions. 3 mana 4/4 is always good. Well for Druid two 2/2s could in fact be better than one 4/4 with all the wide board buffs we have now. Trading is more spread out which could be good but also could be bad in some cases. So yeah, there is a difference. I wish they would revert force of nature and send it to wild. I miss old school Midrange Druid. By keeping it an epic card it means you get more dust when it shows up in your brawl pack. 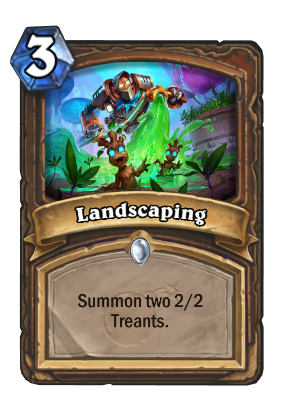 With the rush keyword being a thing, they could make it "summon three treants with rush" and be balanced. Original FoN issue was the face damage. As easy as one, two, tree! Well, these Treants' bark is worse than their bite.